The debate over whether an audio clip says "yanny" or "laurel" is tearing the Internet apart. 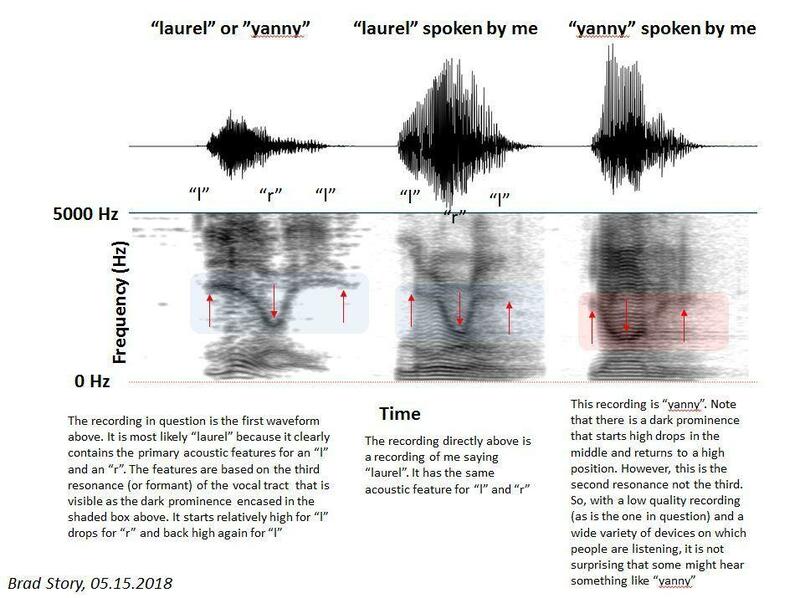 Professor Brad Story analyzed the acoustic features of the words "yanny" and "laurel" from the viral audio clip and from his own voice. The short audio clip has sharply divided the Internet since it was posted on Twitter by Cloe Feldman on Monday. Why would people hear two totally different words? To answer this, we consulted experts in how human brains perceive sound. 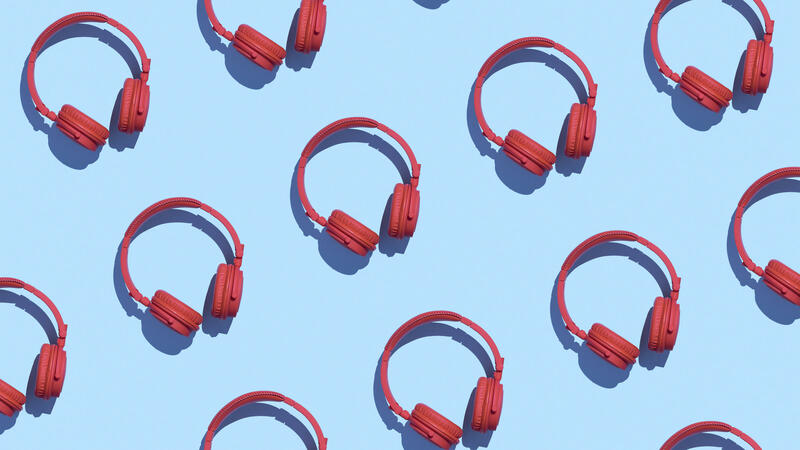 Nina Kraus, a neurobiology professor at Northwestern University, says, "It is not at all surprising to me that two different people will take a sound that is admittedly acoustically ambiguous and hear it differently." "Acoustically ambiguous" in this case means that it's a very poor-quality file. That is crucial in explaining why people are hearing different things. The viral tweet posted by Feldman was actually taken from a post on Reddit, as she has explained. And the person who appears to be the original Reddit poster, RolandCamry, says that he made it from playing a recording from Vocabulary.com out of his speakers. In other words, there are multiple steps that degrade the quality of the audio. The poor quality of the audio, likely re-recorded multiple times, makes it more open to interpretation by the brain, says Brad Story, a professor of speech, language and hearing sciences at the University of Arizona. Primary information that would be present in a high-quality recording or in person is "weakened or attenuated," Story says, even as the brain is eagerly looking for patterns to interpret. "And if you throw things off a little bit, in terms of it being somewhat unnatural, then it is possible to fool that perceptual system and our interpretation of it," says Story. Story says the two words have similar patterns that easily could be confused. He carried out his own experiment by analyzing a waveform image of the viral recording and compared it to recordings of himself saying "laurel" and "yanny." "So with a recording that's somewhat ambiguous and low-quality, it's not surprising that some people may flip those when they're perceiving that word," Story says. That probably wouldn't happen in a high-quality recording, he says, or if it were spoken in a full sentence to give people more context clues. Britt Yazel, a neuroscience doctoral student at University of California, Davis, analyzed the sound file and filtered out all the sound above the frequency 4.5 kilohertz. That filtering "takes away the entire perception of hearing the word 'yanny' and all you get is the word 'laurel,' " he says. "If you lose the high frequencies, the illusion goes away." Some people have greater sensitivity to higher frequencies or lower frequencies, Yazel says, which could explain part of why people hear different things. "But not only that, the brains themselves can be wired very differently to interpret speech," he says. For example, if you hear the sounds in either "yanny" or "laurel" more in your everyday life, you might be more likely to hear them here. It's also worth noting that people are expecting to hear either "yanny" or "laurel," which makes it more likely that they actually will hear one of those words and not something else. For Kraus, the Northwestern professor who runs a laboratory on the biology of how humans process sound, it matters little how people interpret this single word in a poor-quality, idiosyncratic recording. Where this does matter, she says, and where similar issues are at play, is how people fill in the gaps of their hearing when faced with a noisy context. Much of what you hear, she says, is about what you're expecting to hear. She provides another example. First, listen to this noisy clip and see if you can hear a sentence. Next, listen to this clip, which is no longer noisy. Finally, go back to the first clip. Now that the brain is primed to cut through the noise, you will probably be able to hear: "The juice of lemons makes fine punch." "We all perceive the world a little differently based on our experiences," she says. It's crucial, she adds, to "use your experience with sound and what you know about it to fill in the gaps."